By Kimberly Charles Check Please! Bay Area is one of the most popular shows we have in San Francisco, and it’s an Emmy award winning program in its sixth season this year. Hosted by noted wine writer, author and effervescent personality Leslie Sbrocco, it’s a guilty pleasure for most San Francisco food-obsessed folks. What I like about it is the amazing diversity of tastes not just in food, but in preference that people have in their dining experience, and San Francisco can deliver that whether it’s Dim Sum or Danko that you’re seeking. As I’ve made a career out of the worlds of wine, spirits, beers, coffees, teas and amazing food, I of course always put the quality of the food first over ambiance, service etc. I’d be lying if I didn’t say that nothing makes an experience than amazing service and an inviting atmosphere in a restaurant, but lately I’ve been sampling from our killer array of food carts and trucks that we have in the Bay Area. Saturdays I love to go to the cul de sac at the end of Valencia Street near Market Street to sample the different trucks from Off the Grid, and I follow several food carts in my neighborhood, the Mission, to see where the cremebruleecart is. Our office is by the AT&T ballpark, which is great if you want a hot dog and some pub food, but it’s a bit of a culinary wasteland, so watching for any cool trucks coming our way during lunch hour, whether it’s Seoul on Wheels, Sam’s Chowder Mobile or the Crispy Tacos truck, I’m there! 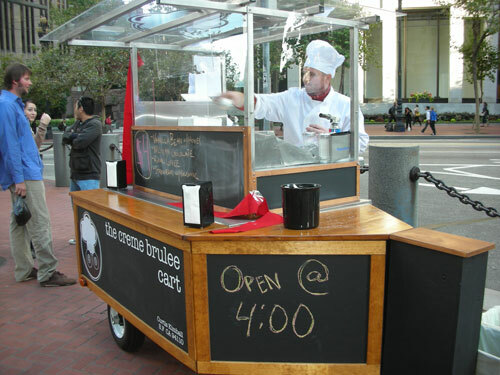 On October 27th at 7:30 PM PST, stay tuned to find out which Bay Area mobile culinary treat I chose. Cheers!